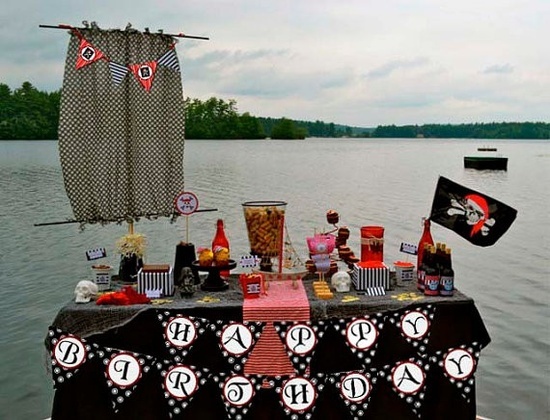 Pirate birthday party ideas provide bloody adventures on the high seas for your captain and the whole crew. Every child dreams of becoming a pirate with a sword in his hand and a patch on his eye searching for hidden treasure. What a treat to be able to visit the land of make believe. Enter if you dare into the world of pirate ships, treasure chests of gold and jewels, skulls, and swords. Shiver me timbers! After a long journey at sea, me mates are looking for a little fun. 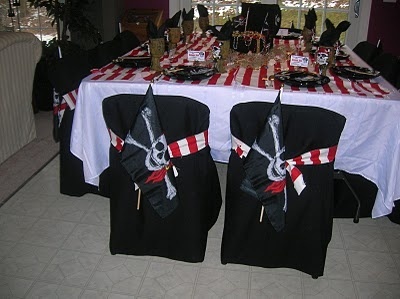 There is no such thing as overdoing it when it comes to pirate birthday party ideas. It's a wonderful excuse to let your imagination run wild with bountiful booty and over-the-top indulgence. party ideas? Find the loot here. 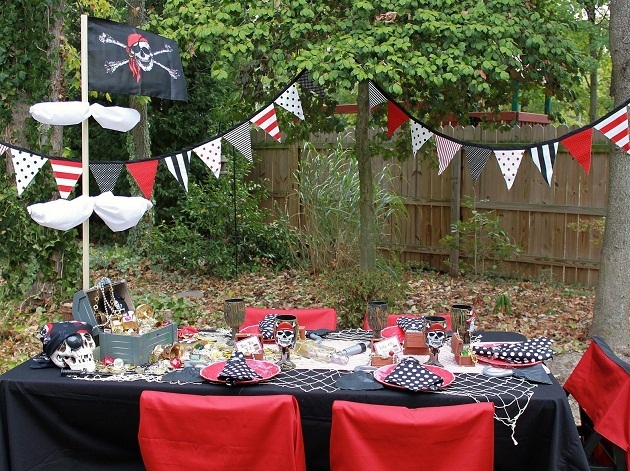 Chart a course to pirate fun with tables filled with treats and treasure. The water is optional, but the ship's mast is a must. We love these black chair covers accented with a pop of color. The red and white strips of fabric tied around the chairs is just the right touch. 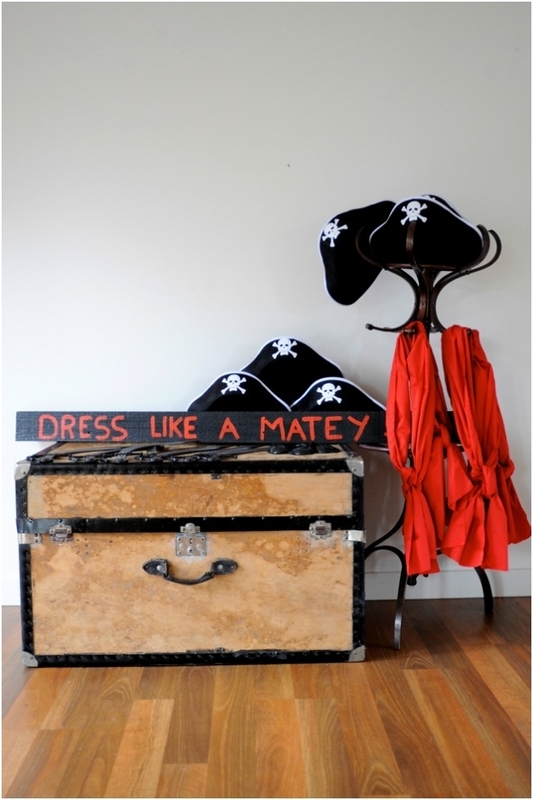 The Jolly Roger flag completes the perfect perch for your little buccaneers. "X" marks the spot for sweet treasure. Nothing says yummy like a fleet of cupcakes and kids know it. We love how the cupcakes serve as the centerpiece with extra goodies tucked in around them. This sail is ideal for drawing attention to the occasion. Made from waterproof vinyl, it was proudly hung on Captain Sam's bedroom wall after the party. It is never one thing that makes the theme believable. 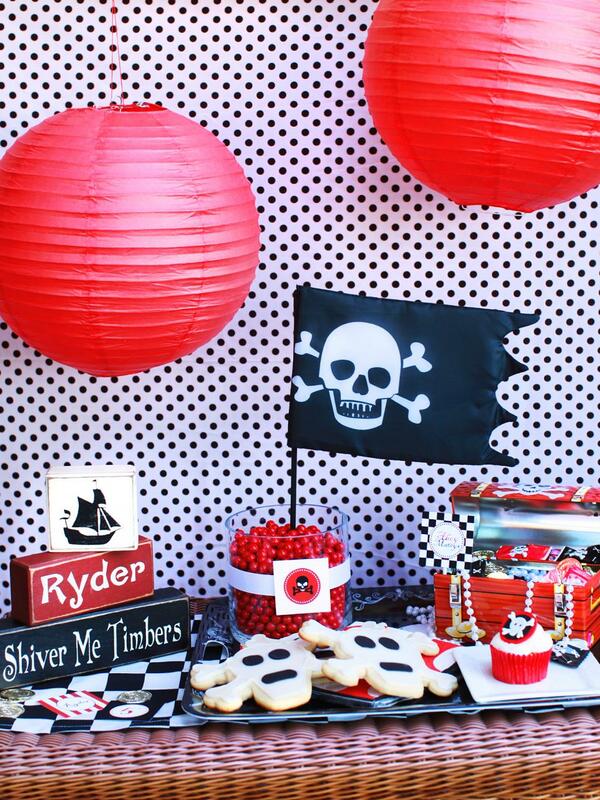 Here, countless pirate birthday party ideas come together in harmony from the fishnet overlay to the skull cups. These red paper lanterns dangle in midair to add a pop of color. Pirate themed treats and treasure look out from below to the delight of the buccaneers. 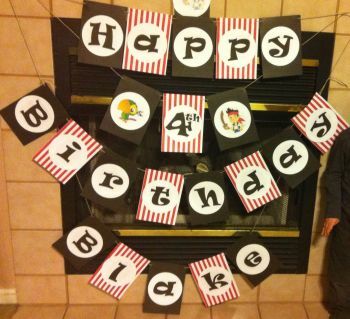 All hands on deck for invitation pirate birthday party ideas. Invite the entire crew to a swashbuckling adventure. Invitations should set sail two weeks before the party. 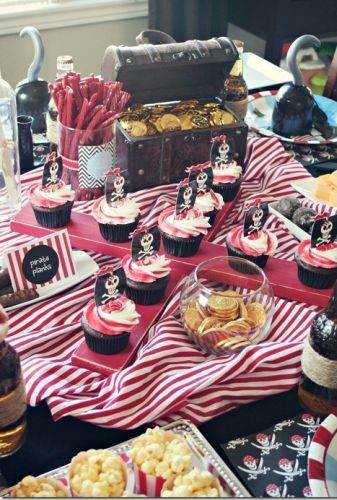 To make life easy, invest in pirate birthday party ideas with purpose. 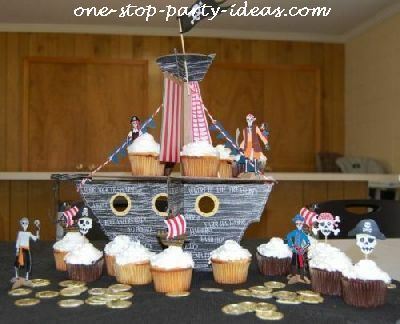 This pirate ship centerpiece makes a perfect carrier for cupcakes and adds to the pirate theme. Where's the utensils? Blow me down, they are in the coconut. Dress your utensils for the occasion and add a hair-raising element to your table. For maximum impact, come up with a seaside inspired welcome for the front door. 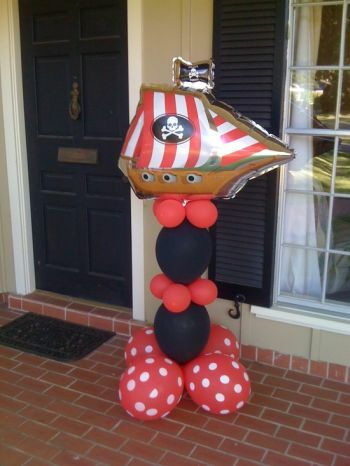 Greet your swabbies with this pirate ship perched above a column of balloons. 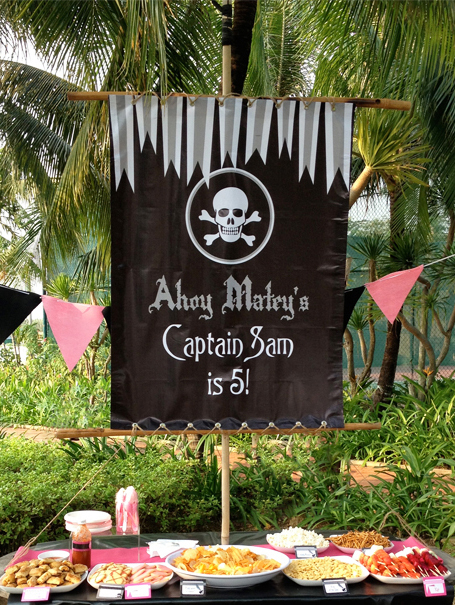 Great birthday banner that even a landlubber would love. Festive garlands are a good way to echo the elements of the party. The most important thing is to make every kid feel the thrill of being a pirate. Providing commonly associated with piracy items such as earrings, beards, eye patches, hooks, peglegs, pirate hats, and a parrot should help. 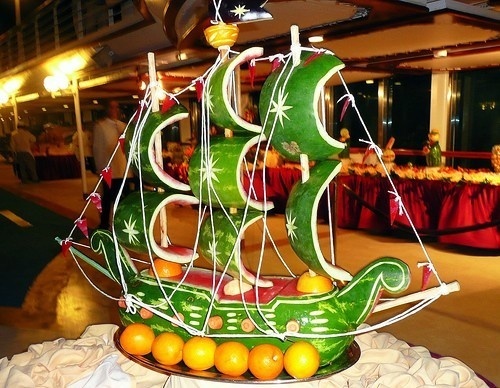 Create a stunning centerpiece and serve a refreshing treat in a hollowed-out watermelon. We love these watermelon ideas for the pro or the amateur. Either one will make a big splash. Every little pirate needs his vegetables in order to stay strong enough to sail the high seas. 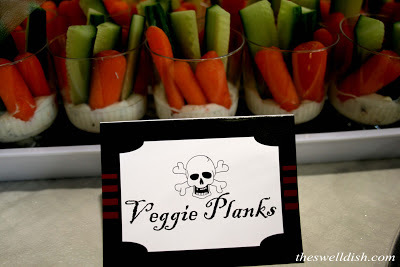 These pirate birthday party ideas for vegetables are simple treasures that are healthy and presented in a kid friendly way. So easy to make and fun to eat. These healthy appetizers feed the imagination and satisfy little appetites. 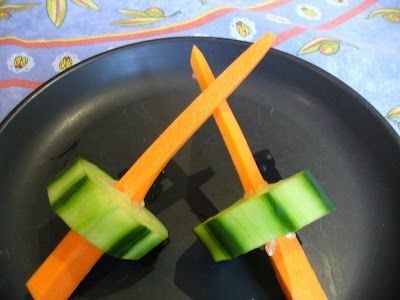 Carrot stick and cucumber veggie swords bring the pirate theme to the vegetables. 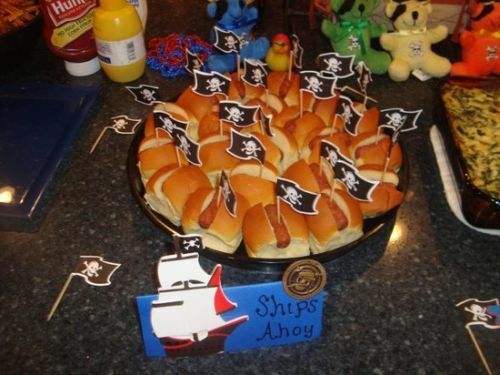 Make your pirate grub the center of attention. Kids love food imaginatively presented and these tasty mini hot dogs are just the right size and easy enough to make yourself. 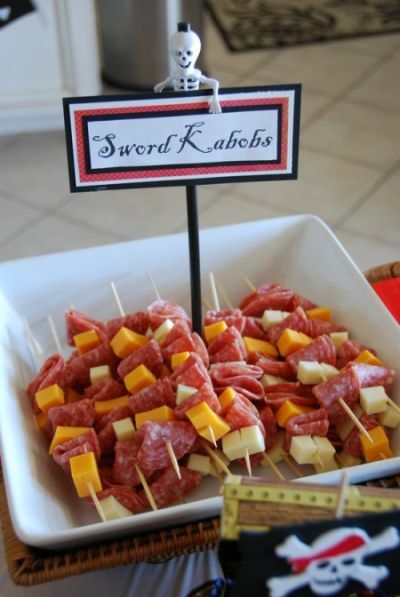 These sword kabobs consist of pepperoni slices and two choices of cheese. Fold your pepperoni slice into fourths and place onto wooden skewer alternating with cheeses. Thrill them with a skeleton hanging around to keep an eye on the food. 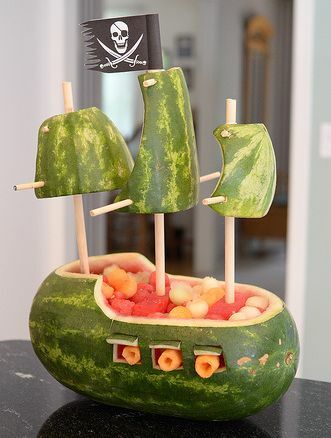 Pirating is thirsty work, so treat your mateys to a refreshing beverage. 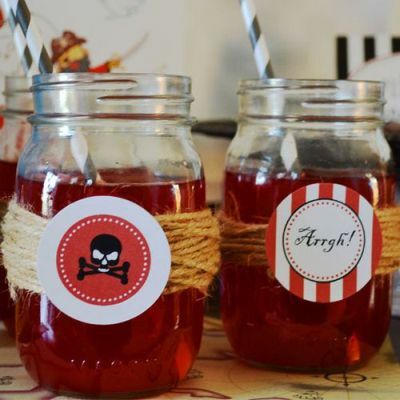 Decorate Mason jars with all of your favorite pirate birthday party ideas, keeping the colors and pirate motifs true to the theme. Make the birthday cake an eye-catching one with plenty of theme influence. 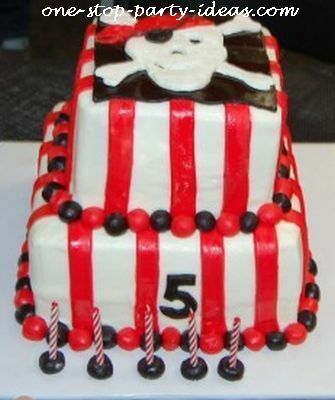 This homemade pirate birthday cake was special because it was made by family and vividly matched the color scheme. Keep spreading the sweetness. 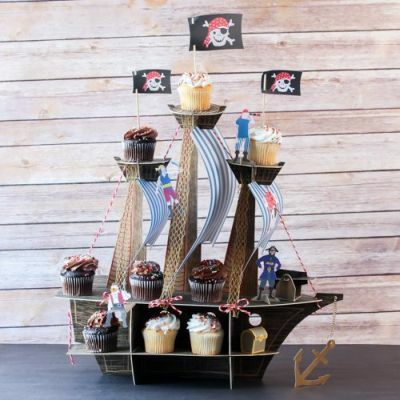 When it comes to serving cupcakes, inspiration can be found anywhere, even a cardboard ship complete with crew and plenty of gold. 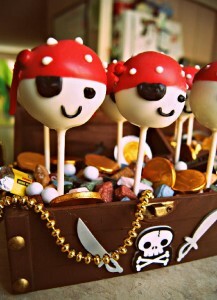 Looking for the perfect way to display your pirate cake pops? 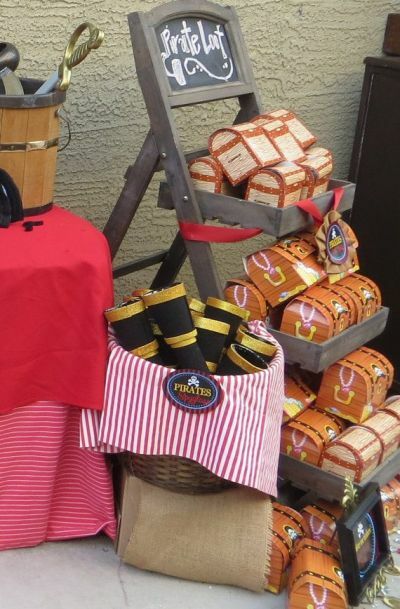 This treasure chest base ensures that these delicious treats are seen in the very best light. A great way to stash yer cupcake pops, mateys. 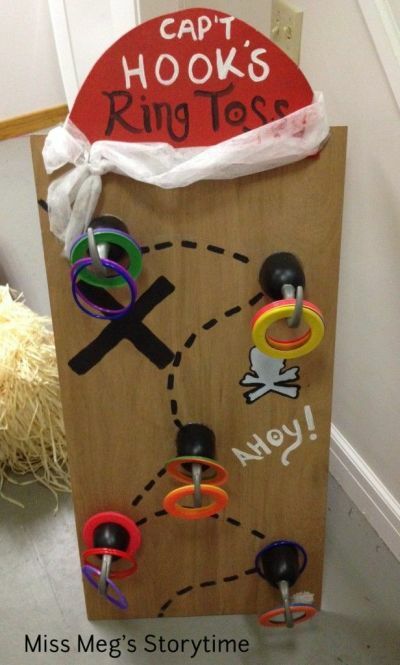 Familiar ring toss game presented in true pirate fashion. 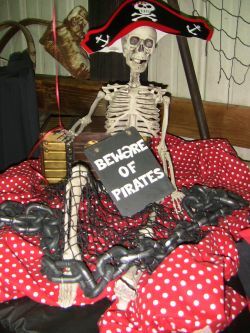 Using pirate hooks to catch tossed rings adds a quirky, unexpected edge to the presentation. Yesterday's trash becomes tomorrow's pirate treasure. 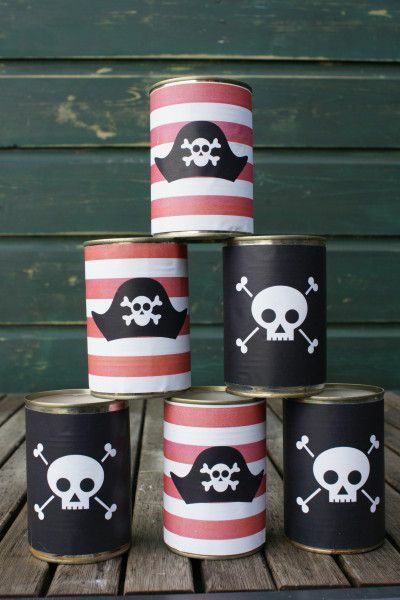 Here, recycled cans are repurposed into a rip-roaring pirate party game. Adventures on the high seas. 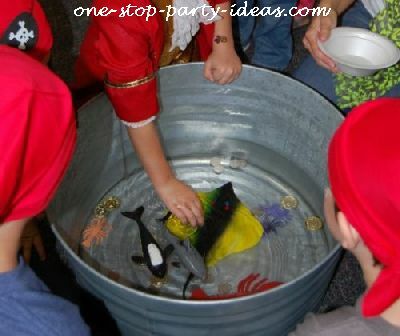 Pirates must brave shark infested water to find the hidden gold. Have one player try to grab the gold out of the water and avoid the sharks while blindfolded. Gather the other players around the pool to guide the blindfolded player by yelling "shark" whenever one is near. The game is over as soon as each player finds a piece of gold. 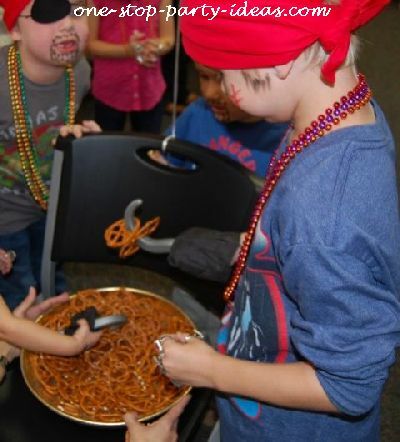 Each child attempts to pick up as many pretzels as possible using a pirate hook. The pirate with the most pretzels wins a prize. Pin the patch on the pirate. 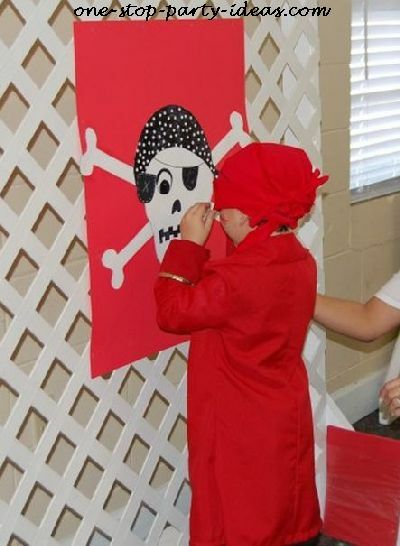 Play pin the patch on the pirate at ye birthday party. Fun for all ages, this game is as much fun for the pirates as the crew. 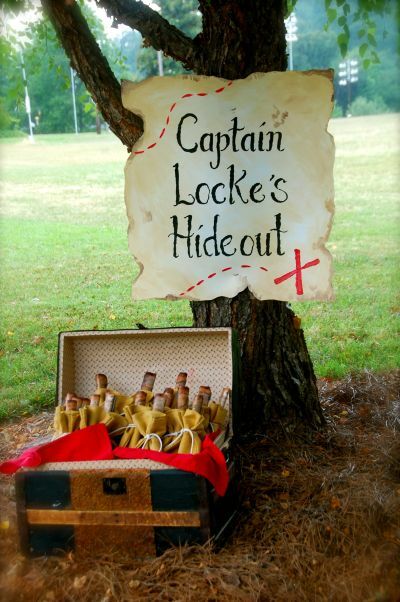 Treasure hunts are a must to include in your pirate birthday party ideas. 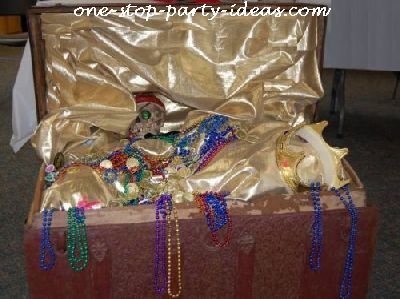 Before the party, hide a treasure chest filled with loot. 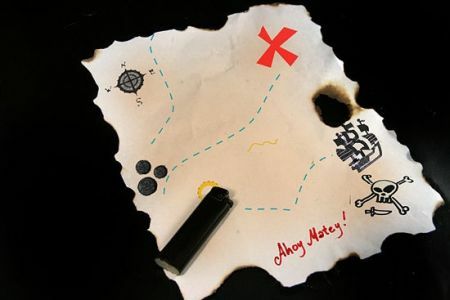 Prepare 3 maps that give a pictorial hint to finding the hidden treasure. Map 1 shows the location of map 2, map 2 shows the location of map 3, which shows the location of the hidden treasure. Here is a pirate twist on the traditional musical chairs game. The red squares represent an island. Put out enough islands for every guest except one. Once the music begins, children move from island to island. When the music stops, whoever is not on an island is cast out to sea. Remove one island and continue. Whoever is the last child standing on an island wins the game. Ahoy! A pinata provides great entertainment for your birthday celebration. Fill with treats of your choice and allow the captain (birthday boy or girl) to lead the crew. Getting the presentation right makes all the difference. Here, favor boxes are creatively displayed for little guests to grab and go. Lining this old chest with shiny gold fabric makes a convincing treasure chest. Let kids grab some loot as they leave the party. 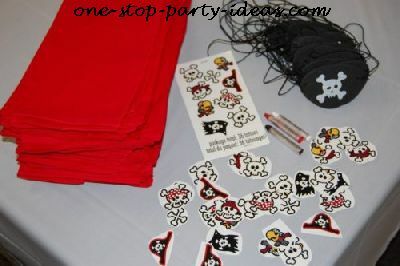 Gold chocolate coins, tattoos, rings, and stickers look particularly good to little pirates. For birthday parties, make sure all your guests are in character. Red napkins easily become bandanas for their heads or necks while eye patches, stickers, and tattoos complete the gnarly look. Every pirate desires to find hidden treasures. 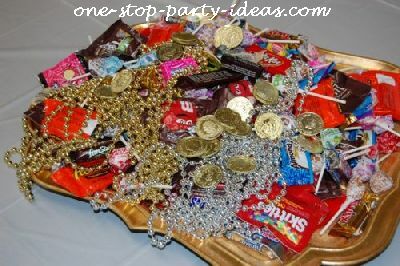 This treasure served on a golden platter features gold coins, jewelry, and valuable candy of all sorts. We searched the seven seas and could not find a better sword presentation. 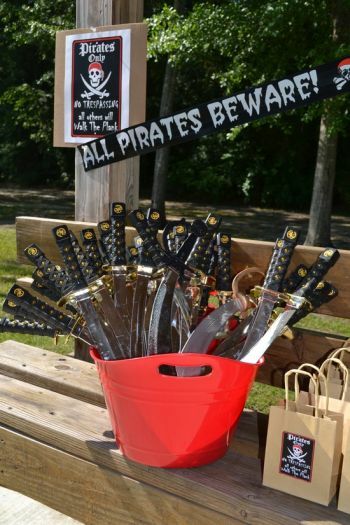 This pirate favor idea works well for both plastic or balloon swords. Captain Locke's hideout is where you will find me hearty favors. 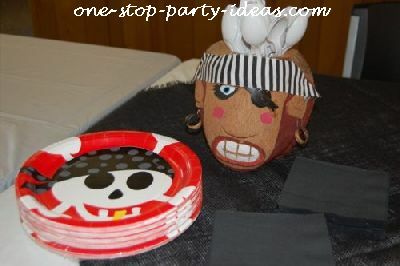 Pirate birthday party ideas such as this make the favor presentation part of the treasure. We've reached our rope's end!